Here’s a mug that could save you from surefire death just in case your gun locks up or you’re caught sipping a hot cuppa in the middle of a battle field. The Humvee of breakfast ceramics, the Battle Mug is as tough as a mug could get, and we’ve been guessing this one’s strong enough to take a bullet and yet have your beverage intact. Made from T6 billet aluminum, the Battle Mug comes with mil-spec 1913 scope rails and a range of attachable accessories to level it up on macho-ness. 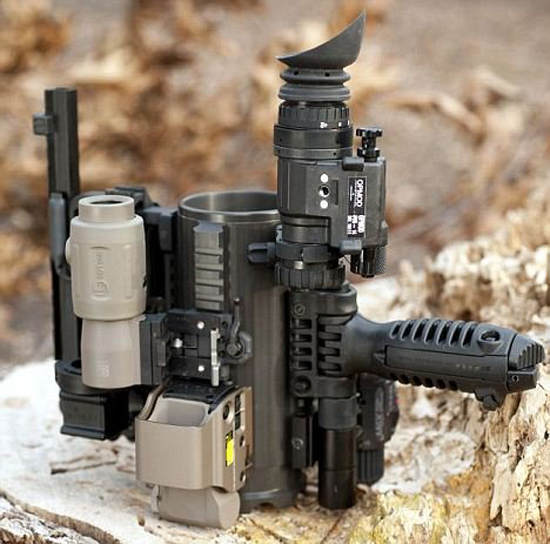 With an attachable night vision unit, different laser dots, a bottle opener, carry handles with night sights, a bipod and an AR15 carry handle, this mug is the perfect way to enjoy a steaming hot beverage while out at a battle field or in the wild with each sporting a unique serial number. Priced at $250 a piece, the Battle Mug also doubles up as a steady weapon for you to fling if your weapon of choice betrays you.